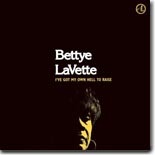 Bettye Lavette no longer should be considered as a Comeback artist ... she's back to stay, and proves it with her latest disc, I've Got My Own Hell To Raise. It's this month's Pick Hit. Johnny Nicholas continues to produce great music from his home in the hill country of Texas. Livin' With The Blues 2005 is this month's Surprise pick. This month's Flashback showcases a set of long-lost recordings from Chicago street singer Blind Arvella Gray. This month's What's New section features new releases from Paul Oscher, Rusty Zinn, Alvin Youngblood Hart, John Mayall, Bobby Purify, Ellis Hooks, Rick Lawson, Billy Ray Charles, Ken Saydak, Edwin Holt, Kelly Joe Phelps, and more.